[PDF] Machine Learning for Multimodal Interaction: 5th International Workshop, MLMI 2008, Utrecht, The Netherlands, September 8-10, 2008, Proceedings (Lecture Notes in Computer Science) | Free eBooks Download - EBOOKEE! 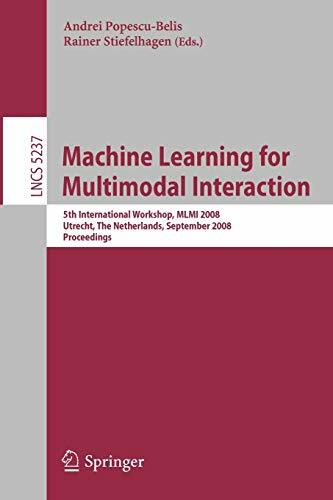 Description: This book constitutes the refereed proceedings of the 5th International Workshop on Machine Learning for Multimodal Interaction, MLMI 2008, held in Utrecht, The Netherlands, in September 2008. The 12 revised full papers and 15 revised poster papers presented together with 5 papers of a special session on user requirements and evaluation of multimodal meeting browsers/assistants were carefully reviewed and selected from 47 submissions. The papers cover a wide range of topics related to human-human communication modeling and processing, as well as to human-computer interaction, using several communication modalities. Special focus is given to the analysis of non-verbal communication cues and social signal processing, the analysis of communicative content, audio-visual scene analysis, speech processing, interactive systems and applications. No comments for "[PDF] Machine Learning for Multimodal Interaction: 5th International Workshop, MLMI 2008, Utrecht, The Netherlands, September 8-10, 2008, Proceedings (Lecture Notes in Computer Science)".